I’m stretching the definition of “single serving” somewhat, but the difference between these sites and other education-related sites like Edmodo or Teachers Pay Teachers or BetterLesson is a) these have a narrow focus, b) they reflect a very particular vision for how students learn or how teachers become better teachers (eg. 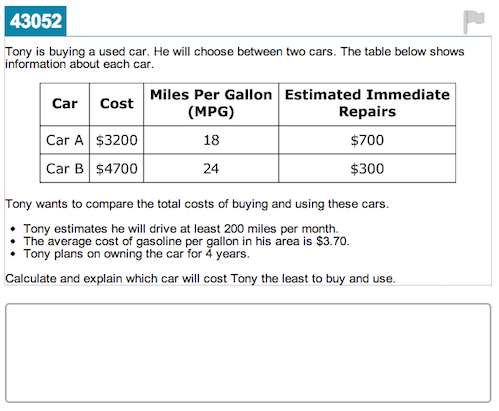 Math Mistakes believes it’s important that teachers examine student errors; Estimation 180 prioritizes number sense; Activeprompt makes it easy to ask one very particular question. ), c) they pursue that vision relentlessly, d) they were created and maintained by teachers, not corporations. It’s a treat getting to work in a place as creative and industrious as the math edublogosphere. For real. The majority of these sites were set up with cheap web hosting and free software like WordPress or Weebly. The barriers to taking an idea and turning it into a digital tool have never been lower. So what’s your idea and how will you turn it into a tool in 2013? What are other disciplines doing along these lines that I’ve missed? 1/19. Honolulu. HCTM Annual Meeting. 1/24. Hong Kong. 21st Century Learning Conference. 2/2. Singapore. Centre for International Education. 2/23. Ireland. Computers in Education Society Annual Meeting. MathRecap is a project in modernizing and increasing access to math education conferences. I and my fellow recappers concluded our coverage of CMC-North last week. How did we do? On the one hand, our most trafficked recap, Lisa Nussdorfer’s iPad session, received 538 unique pageviews, which means many more people had access to her talk than just the thirty of us in the classroom where she was scheduled. That’s great. On the other hand, traffic wasn’t so explosive that I’m convinced this kind of site is as useful as it can be. So I’m inviting your commentary: What would make a conference recapping site most useful for you? If it isn’t something you find useful, why not? NCTM is in four months. That’s a pricey ticket and many of you aren’t attending. So what can a site like MathRecap do for you? This is the first I’ve heard of the site, so I missed the announcement somehow, so maybe people just don’t know about it? I’ve added it to my feed though, and included it in my list of mathematics education blogs. I had no idea how what was being discussed translated into classroom practice, what “culturally relevant pedagogy” looks like past one ambiguously phrased word problem, and how the standards of mathematical practice are linked. Blog posts are good. Presentations are good. But what is each format particularly suited to do? In particular, what gets lost when you try to translate a presentation to a blog post? I’ve been faithfully naming the “Learning Goal” with each class for several years now. And frankly, it doesn’t inspire. Yawn. 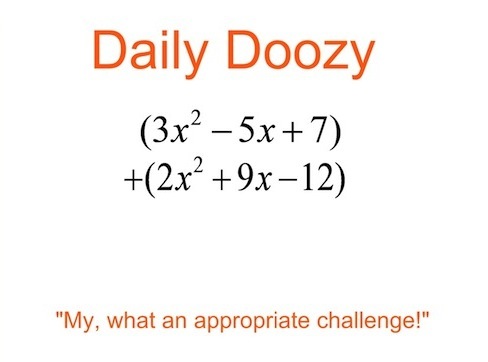 Instead of (actually, in addition to) this, I’ve added the Daily Doozy to my pre-lesson routine. This a really profound shift and it deserves a discussion that’s longer than this capsule allows. He illustrates the Daily Doozy on polynomial addition, also, which underlines a point I don’t make often or well enough: after you have enough experience with variables and numbers, pure math becomes real-world math. Carol Rogers uses two photos and a perfect question to illustrate the power of arrays. Anyway, rumor is that kids love this game so I was optimistic. I took the cards that Kate Nowak links to and modified them a little bit to make a better distribution of numbers (most of the cards in their sets evaluate to 2). I finished with a set of 40 logs, printed them on mailing lables and had my student teacher affix them to index cards that had been cut in half. I gave each color group their appropriate color deck of cards. We had a brief demo and then I let them loose. PSA: Unless you explicitly aim for anonymity in your blogging, do you, your students, and your career a favor by putting your real, full name somewhere on your blog’s home page. The weirdest, coolest opportunities come from having your real, full name attached to your great blogging. I find a lot great bloggers voluntarily (and probably unwittingly) giving up those opportunities. It’s great, first of all, that Khan Academy has all their student exercise code on GitHub for everybody to see. I don’t know any other adaptive system that does that. 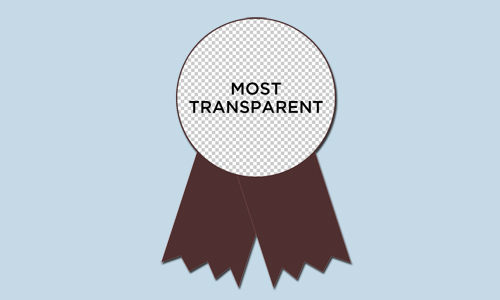 I figured there had to be a better way to reward them for that transparency than the criticism and judgment I’m about to post here, so I made them a badge also. Their code illustrates the different ways good math teachers and good programmers try to figure out what students know. Take proportions, for instance. Here is the code that runs beneath Khan Academy’s proportions assessment. 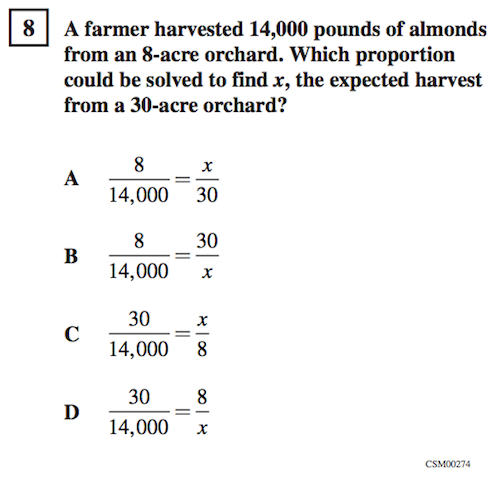 In each of the dozen files I’ve reviewed, Khan Academy first generates some random numbers that meet certain criteria. In the proportions assessment, they call for three random unique integers between 5 and 12. No decimals. No negatives. No zeroes. Then they use those numbers to generate exercises. With proportions, they insert an “x” randomly into that list of numbers. The final order of that list determines the proportional relationship that students will have to solve. But good teachers are more than random number generators. They create exercise sets that increase in difficulty, that ask students to demonstrate mastery in different contexts, all because proportions are conceptually difficult but procedurally simple. It’s extremely easy for students to get by on an instrumental understanding of proportions alone. (eg. “All you hafta do is multiply the two numbers that are across from each other and divide by the number across from the x.” Boom. It’s badge time.) It’s especially easy when the only thing that changes about the problem is the random numbers. But forget good teachers for a minute. Let’s look at the bar set by various standard-setting organizations. Here is what you have to do to demonstrate mastery of proportions on a) Khan Academy, b) the California Standards Test, c) the Smarter Balanced Assessment. You’ll do a handful of problems just like this, with different random numbers in different places. Here we find a difference between good math teachers and good programmers. The good math teacher can create good math assessments. The good programmer can make things scale globally across the Internet. The two of them seem like a match made in math heaven. Just get them in a room together, right? But the very technology that lets Khan Academy assess hundreds of concepts at global scale — random number generators, string splices, and algorithmically generated hints — has downgraded, perhaps unavoidably, what it means to know math. 2012 Dec 13. Peter Collingridge points out in the comments that Khan Academy has a proportions assessment comparable to the California Standards Test. If they have anything similar to the Smarter Balanced Assessment, please let me know.